Here’s an offer that disproves the theory that you can’t find a good bottle of Bordeaux for under a tenner. Situated in Listrac, a few miles inland from the more famous village of Margaux, Château Fourcas Dupré is a member of Bordeaux’s prestigious “Union des Grand Crus”. This property made one of their best ever wines in 2015 – a great vintage that was particularly successful in the southern part of the Médoc. We tasted it recently and were so impressed that we bought a large parcel at a special price which means we can now offer it at under £10 per bottle in bond – with further discounts for large purchases. This wine received an impressive 91 point rating from the leading Bordeaux critic, Neal Martin, ranking it the equal of wines such as Carruades de Lafite, Duhart Milon and La Lagune which sell at far higher prices. 2+ cases 105 each, 5+ cases 100 each. 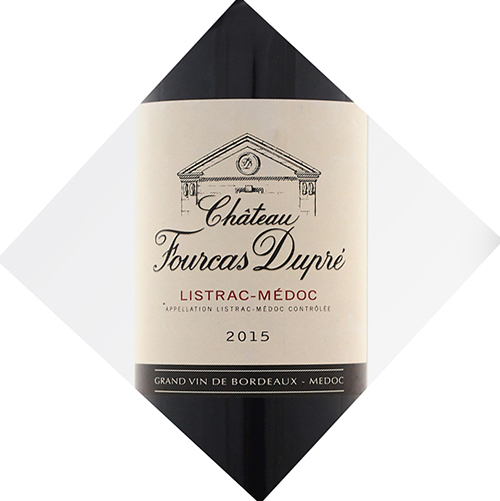 "The 2015 Fourcas-Dupre, which showed extremely well from barrel, has a classic pencil lead-scented bouquet that builds nicely in the glass, blackberry and briary scents very expressive after just a few swirls of the glass. The palate is medium-bodied with a fine line of acidity. This is not a deep or powerful wine, but it has a certain elegance and I appreciate the precision on the finish. You could broach this early or just enjoy over the next 12 to 15 years." "Bright ruby in colour, with juicy cherries and red berries on the nose. There is a hint of smoke, that pairs nicely with subtle graphite notes. The palate is plump with plums and cherries, yet light-footed, with fresh acidity and fine tannins gently framing the core of cool red and black fruit. Hints of earthiness and smokiness add to the complexity on the finish. Soft, supple and ready to drink now."